The Combi HTF horizontal fully automatic tray former features heavy-duty welded steel construction and is ideal for high volume tray forming production. The HTF will form regular slotted trays, in various configurations, to accommodate the agriculture, food processing and distribution industries. 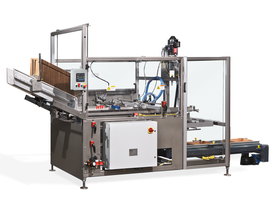 The HTF's inline and compact design utilizes a mechanically linked tray pick-up and transport mechanism for precise placement through the glue application and forming cycle. For added flexibility, the Combi HTF heavy duty tray former easily integrates with a number of Combi case packers.